Need an Ice Melt System? December is here, and along with it comes ice and damage to your roof. It doesn’t have to be that way though…. If you are interested in having Newhouse & Sun Construction evaluate your home or business for a rooftop ice melt system, give us a call! 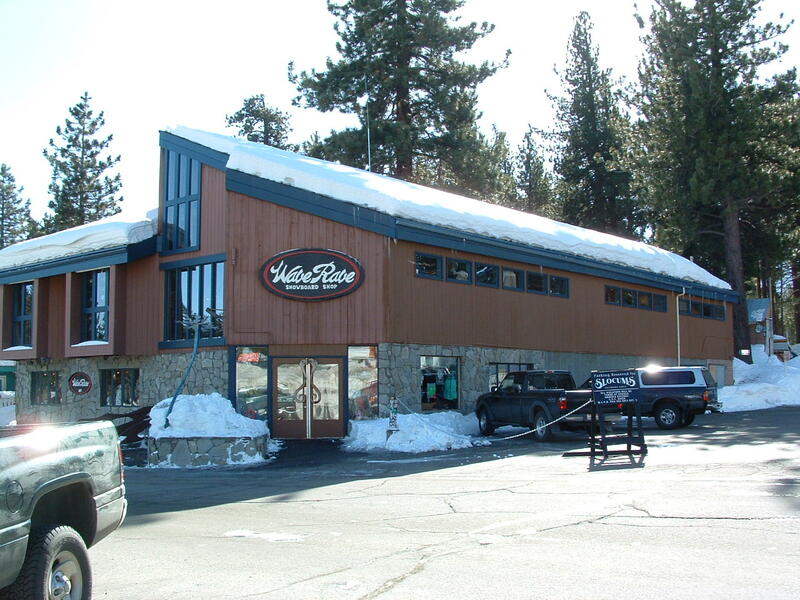 We install the state-of-the-art Bylin/Raychem Rim2 panel system, and as long as the snow and ice hold off, we are installing! Beat the 10-15% price increase coming for 2016 by acting NOW! Winter is on its way, and along with it comes snow and ice build up. Inspecting and repairing your roof now can reduce the risk of damage to your home due to ice dams. Here is a short video with all of the things you should look for to make sure your roof is ready for winter. If your roof is in good shape but you still find that your home is prone to ice dams, you may want to consider installing an ice melt system. Newhouse & Sun offers state-of-the-art ice melt systems. If your hurry, you still may be able to get one installed before the snow comes. Here is an informational video on how the Raychem Roof Ice Melt System efficiently and effectively prevents icicles and ice dams from building up on your roof eaves and valleys. Raychem Roof Ice Melt Systems have successfully prevented ice dam and icicle formation on roofs across the country for over a decade. 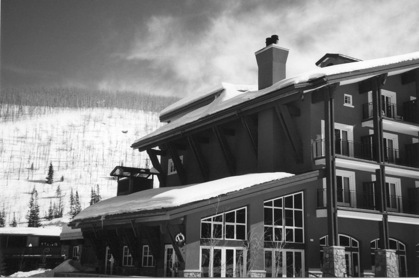 Unlike other solutions, such as a cold roof system or zigzag heating cable, Raychem’s RIM Systems are successful preventing ice dams and icicles in heavy snow regions as well as moderate snow regions. Raychem’s RIM Systems specifically target the ice dam and icicle prone areas of a roof regardless of the design, complexities, or snow load. Area Classifications, determine which Raychem Roof Ice Melt products are right for the job by identifying heavy, moderate, and light snow load areas. As roof snow accumulation increases, ice dam and icicle formation likewise increase. Subsequent water ponding can lead to roof leaks, internal building damage and possible mold issues. Falling icicles can create lower roof damage, deck damage and people safety issues. Winter storms build up snow on the roof. Heat from the building (through insulation, chimneys, and roof vents) and from the sun (solar gain) causes roof snowmelt. Melted snow runs down roof lines to valleys and eaves. The melted snow refreezes at the base of the valleys and at the roof eaves. As day/night time temperatures cycle up and down, the ice dams and icicles continue to grow. Icicles cause ‘people and property safety’ concerns. Protect your home. Call Newhouse & Sun today! Last year was one of the worst winters for ice damage to homes. It seems almost everyone I talked with had some form of damage. Whether it was damage to the roof itself, the gutters, the inside of the home, or a complete roof collapse, it was disheartening to see so many home owners suffer! 1, Make sure your gutters are cleaned out. Leaves and debris can cause the gutters to back up and ice to form on your roof. Winter storms build up snow on the roof. Heat from the building (through insulation, chimneys, and roof vents) and from the sun (solar gain) causes roof snow-melt. Melted snow runs down roof lines to valleys and eaves. The melted snow refreezes at the base of the valleys and at the roof eaves. As day/night time temperatures cycle up and down, the ice dams and icicles continue to grow and cause damage to your home. 2, Make sure you remove excess snow from your roof throughout the winter. This cuts down on the amount of snow melting and as a result, less water in your gutter to freeze and build up. The best way to do this is with a roof rake. Scrape as much as you can off for the best results. You may want to get a roof rake now. Once the snowstorms start, they are next to impossible to find! 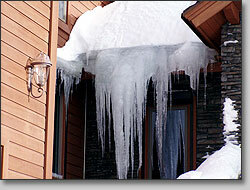 In New England, we are very familiar with the problems and costly repairs ice dams can create. Newhouse and Sun has partnered with Bylin, a manufacturer that provides a product that eliminates ice dams. Our ice melt products melt away snow and ice from critical areas of the roof stopping the formation of ice dams. We have many satisfied customers that didn’t have to worry about ice dams during the 2010-2011 winter since the heated panels were installed. 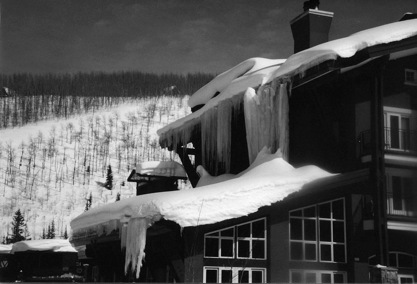 Ice dams and icicles occur as a result of: Snow buildup on the roof Heat loss from the building Through insulation Through chimneys Through roof vents Winter temperature fluctuations – freeze/thaw cycles Solar heating during winter days with below freezing nights As roof snow accumulation increases, ice dam and icicle formation likewise increase. Subsequent water ponding can lead to roof leaks, internal building damage and possible mold issues. Falling icicles can create lower roof damage, deck damage and people safety issues. Ask us how to keep your driveway and walkways free from ice and snow! 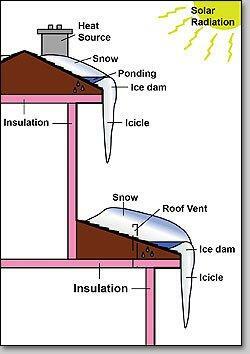 Ice dams usually form close to the lower edge of the roof. Massachusetts building code states that the affected area for ice dams is 3 feet inside a heated wall. This is why today’s roofers install ice and water shield on all lower edges, on all new roofing installations in New England. Ice and water shield comes in a roll that is 3 foot x 50 feet. If you do not account for the soffit area, and only use the three foot length, you will leave the affected area exposed. Due to poor insulation and ventilation to0 much heat escapes the living space (poor insulation), then it gets trapped against the roof (poor ventilation). Once heat escapes the living space, it should be vented out of the house. Once the escaped heat melts roof snow, water hits established dams, or creates new ones, and water backs up under the shingles. Older roofs do not have ice and water shield underlayment, so the water comes into the dwelling. Get the snow off your roof; do not allow it to sit there. Either remove the snow yourself, or hire a roofing company to maintain your roof. Remove the lower 6 rows of shingles and install ice and water shield. Make sure you have good air flow from your soffit to your ridge vent (good ventilation). Make sure you have adequate insulation, and that your insulation does not block your ventilation. Install metal standing seam roofing. Dormers: It is difficult to insulate and ventilate most older dormers, and they tend to be low sloped. These should be completely covered in ice and water shield. Bay and Bow windows: again for the same reason, poor insulation and ventilation. Walls: Older homes with blown in insulation, insulation settles and allows to much heat to escape through the siding. As one of the nation’s leading distributors and installers of innovative and high quality rooftop de-icing products, we make problems with ice dams and icicles a thing of the past for homes and businesses in Massachusetts and New Hampshire. At Newhouse and Sun Construction, we create customer solutions that will prevent and get rid of ice dams and icicles on your home or buildingFOREVER. Adding more insulation, ventilating an attic, installing zig-zag cables, application of heat tape, or even putting on a new roof will not get rid of ice dams; it just puts a band-aid on the problem, and the ice dams will always come back. How Much Heat Is Your House Losing? Since the winter started, New England has had several feet of snow blanket the area. This winter wonderland is beautiful, but it brings with it many issues that homeowners have to deal with. 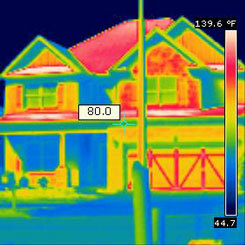 Just driving around the area, it is easy to see which homes and buildings are losing heat. Long and dangerous icicles drape from the sides of buildings, showing that heat is escaping through the roof. This creates ice dams that damage a roof, causing costly repairs. The thing is, roofs are not meant to melt snow, and so what is a homeowner to do? wet areas from rain or leaking pipes. During an energy audit, the above picture was taken of a home where there is significant heat loss through the roof and around the windows. A skilled technician can make recommendations as to how to improve these areas which will help significantly improve your heating costs annually, as well as stop ice dams and icicles. If we were to scan your home, would it look like the picture above? Now is the time to get the facts and fix the areas of heat loss before costly repairs are required. At Newhouse and Sun Construction, we can find areas of heat loss and make recommendations as to how to improve them, saving a homeowner many thousands of dollars annually. If you contact us at 978-657-7274 or at newhousesun@comcast.net before the end of February 2011, we will give you 10% discount off our services. 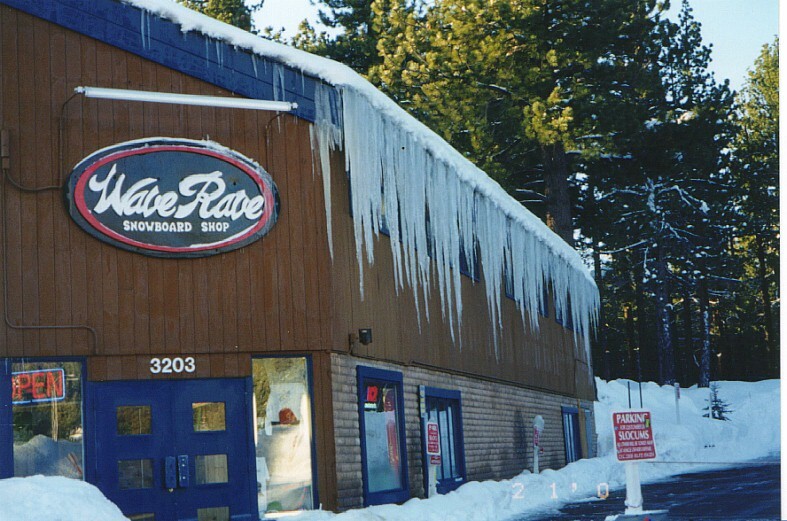 As one of the nation’s leading distributors and installers of innovative and high quality rooftop de-icing products, we make problems with ice dams and icicles a thing of the past for homes and businesses in Massachusetts and New Hampshire. At Newhouse and Sun Construction, we create customer solutions that will prevent and get rid of ice dams and icicles on your home or building FOREVER. Adding more insulation, ventilating an attic, installing zig-zag cables, application of heat tape, or even putting on a new roof will not get rid of ice dams; it just puts a band-aid on the problem, and the ice dams will always come back.